I follow this site daily and found this to be one that is to be shared. So to all the poets, the book writers, bloggers, podcasters and the like……. This entry was posted in Random, Writing and tagged bloggers, Glasgow, podcasts, poetry, poets, prophesy, Scotland, writers, writing on April 17, 2019 by Cate B. As a child I was encouraged to be creative……sort of encouraged. My mom was a creative person, but her way of encouraging me was to have me watch John Gnagy, our version of Bob Ross. She bought pads and pencils and I was left to figure out if I was able to draw or not. That didn’t last long. I learned to sew and knit very basic. I learned to bake and cook and listen to music while singing my heart out in my room. No verbal encouragement came so I gave up very easily. But you cannot throw away the creative juices that lie within you. They may lay dormant but they are always there waiting to spring forth when given just a hint of watering and sunlight. So I have blossomed into a rather good crocheter and baker. But I get antsy. I recently couldn’t ignore the voice that kept gently bidding me to jump in deeper to the creativity. Then, through people I highly respect, I answered with a big YES. Being a person who just loves my friendship with Father God, Jesus and Holy Spirit, I felt a strong tug to paint. But not paint precise images (thank God) but to paint colours. I just love colours. I am drawn to colourful things and they speak to me and actually bring out feelings and senses that otherwise just stay hidden. So now begins a new journey. I started painting in a freeform-type of artistry. Whatever happens with this journey will definitely be a learning experience. At first I absolutely hated what I produced. But I kept them and am moving forward. I figure I will be the first one to get anything out my art simply because I need to see it in a new perspective – as God sees it. I think He likes what I produce, therefore, I need to like it too. I even show my pieces to people. That is a new thing for me. I often ask why I couldn’t just crochet and give it away (I still crochet and bake – try and stop me!) But I know that this is the medium I am to do now. So here ya go, Dear Readers, a glimpse of my new thing……. This entry was posted in Hope, My Colours of Hope, Random and tagged art, colours, creativity, encouragement, God, Holy Spirit, hope, Jesus on December 17, 2018 by Cate B.
I have long enjoyed the book series by Alexander McCall Smith about Mma Ramotswe and her No. 1 Ladies’ Detective Agency. I normally like a bit more intrigue and adventure in a book but the characters that Mr. Smith developed are irresistible. They are so delightful that you could actually picture yourself knowing them or desiring to know them in real life. My son contacted me about Mr. Smith’s upcoming talk at a Library near by. So, I signed myself and my husband up and invited us to eat dinner at my son’s house with the family. I didn’t get nervous until we actually started to get in the car. I know, there is no need to be nervous at a talk and book signing. But I was. I adorned myself in my map of Edinburgh scarf – since I knew he was connected to the University of Edinburgh and lived in that wonderful city – and imagined talking to him. I then decided just to buy the book and have him sign it and listen to his talk. Simple. But, having our own trip to Scotland last year and very fresh in my head, when I handed him my newly purchased book I let out a speed talk that even marveled my mind. Something like this: “I’m wearing my Edinburgh scarf we were there for Christmas and New Years and even marched on Hogmanay and our son just got his Masters from the University-Edinburgh and blah, blah, blah”. He actually managed to follow my rambling and interjected comments. I was thrilled, especially to get to tell my son over there that Alexander McCall Smith congratulated him. I got my breath back once I sat in my seat, thinking of how goofy that was and… he was wearing a kilt! Anyway, what a delightfully funny and kind man. My husband and I laughed out loud totally taken into his stories. He is as delightful as the characters he created. Thank you, Alexander McCall Smith, cheers to you and your writings. Here are some poorly taken photos (with my iphone and star-struck hands)…..
Read his books and have a great day. This entry was posted in Random and tagged AlexanderMcCall Smith, book signing, books, Edinburgh, library, No. 1 Ladies' Detective Agency, Scotlsnd, writing on November 23, 2018 by Cate B.
I haven’t posted in a while. But here I am, posting. Yesterday, I set up a web page for my husband. I already had one on another host site and decided to move it to WordPress. They actually have a handy dandy way of doing that now. A click here, a click there and BAM!, it’s done. Then you just have to tweek a few things. Well, the import was easy. For a person born in the fifties, that is 1950s, AKA, The Happy Days, I have somewhat of a grip on techie things. At least compared to some of my peers. But over the last six months I have noticed an incredible advancement in the cyber-space world. Understand, I love advancing. I love the computer thing even though that was almost syfy in my youth. I do not speak the techie lingo but I was still able to figure things out. Until yesterday. After two to three hours of googling and reading great info in another foreign language – at least to me it was foreign – I sought help from WordPress. After going through lists of possible solutions, which is difficult if you don’t speak computerese, I found a person to chat with. I fell in love. I have no idea if this person was male or female but by the end of our time together I promised them a fresh pie if they ever came to my town. They not only walked me through the steps but they actually understood what I wanted to do and were able to tell me in my language. Geniuses! I can’t say enough about them. I have told my husband many times to please learn how to do the basics. I tell some friends the same thing who want nothing to do with computer stuff. But, in all reality, it is not going away. Well, unless we lose all power and zombie creatures come and take over the world as we know it. Don’t be afraid. Really. It’s hard to us, but how can we even begin to speak into our grand children if we are closed to the world they live in. Let them teach you. Don’t get old. Take it from this Grandma – you CAN do it! This entry was posted in Random and tagged chat, computers, Happy Days, old, support, techie, WordPress, WordPress Support on August 23, 2018 by Cate B.
I posted this back in 2013. Happy St Patrick’s Day!!! Yesterday was St. Patrick’s Day. So to celebrate I made up a few “Irish Blessings”. 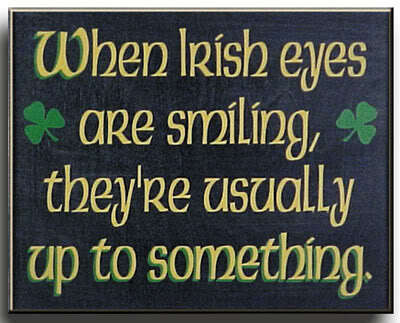 Total fun – I love the Irish! This entry was posted in Random on March 17, 2018 by Cate B. This next leg of our journey takes place just after Christmas when we had a lovely time as a family and partook of a roasted turkey and fixings to accompany it. The next mini trip was, again, challenging to my emotions and body. I am still struggling to understand the emotions of this trip. I know it has some to do with my love of this place that stems back to childhood. I think some to do with any ancestral connections of my roots. And some to do with being with our son and his wife. It does the heart of a mom good to see where her children live and their day-to-day lives. All of these, combined with our bodies being subpar, stirred up a jumble of emotions. All I wanted was to visit my kids and enjoy Scotland, land of faeries and stories and shortbread! I got more than I expected. I’m still processing all my experiences over there. To some of you I may sound bonkers. Please tell me someone out there has experienced the emotions tied to a trip you took! Anyway, we set off one morning by train to Berwick-upon-Tweed in northern England, just over the Scottish border. The very name, Berwick-upon-Tweed, demands to be thought and spoken in an accent other than American. Another quaint, lovely town with scenery to match. Here we caught a bus that wound past views of the sea and farms to Northumberland. We got off the bus and began to walk towards the Bamburgh Castle. I am speechless at this point. Just look at the pictures of this castle from the road. I really am speechless. A perfectly in tact castle and live-able. Passed down from generation to generation. I was struck by it’s awesomeness. Walking up the road to enter the castle was difficult. I was struck by it’s enormous beauty and kept taking pictures. I think I forgot to breathe – LOL – when they say something is breathtaking I can vouch for that first hand. I made it to the top in one piece but had my doubts. The pictures say the rest. Magnificent and Majestic. This entry was posted in My Scottish Journey, Random and tagged awesomeness, Berwick-upon-Tweed, castles, England, Northumberland, photography, photos, Scotland, Scottish Journey, sea, shortbread on March 15, 2018 by Cate B. Here we are in a New Year, 2018, and things did not start out as they usually do in my life. That can be good. But what usually happens is, my husband and I look into our future and talk and pray about what may be or what is in store for us. This end of 2017 was different. First of all, we were in Edinburgh, Scotland. A dream trip. Three glorious weeks in a land that has been in our hearts for a very long time and three glorious weeks in the home and presence of our middle son and his wife – who just happen to live there for a season. We did not get back to our home in the USA until the 8th of January. And we even came home with jet lag and a virus, so to bed we went. By the time we recovered I felt that I needed to enter the New Year again. Can I have a do-over? Now that I’m almost completely over this annoying sinus-type virus, I am beginning to reflect more on our trip and on this New Year. You see, three and a half years ago we moved to The Burg, a small mid-western town about an hour outside of Kansas City. Rural. Farms all around us. Quiet. The town has a University smack dab in the middle of it. A USAF Base is just a few miles away. Plenty of activity, yet plenty of quiet. The best of both. And only a quick forty-five to sixty minute drive to “the city”. We moved here temporarily while our other son and wife attended the University and we cared for our grand daughters while they were in class. A wonderful gift to be a part of their formative years. A bond with those girls that cannot be broken. We rented this little house temporarily. It is small. It is neglected. It is challenging. It is a home. Our son and daughter moved back to Kansas City and we decided to stay in this great little town. We have made precious, life-long friends and love the area. But the house. We really need to move to a better dwelling. We have goals and visions for the future and it does not include this little neglected building. I have a friend who lives on an island. She sends me a text of encouraging words and prayers every day. She told me, just yesterday, when I told her of our need for a different house, “Not good. Always feeling transient.” She is praying for us. This explains a lot of my wandering in my head about where we will live. But as I wander over the last three years I always come back to this town. I just need to feel grounded, no longer transient, no longer temporary. I do hope this is the year to find that perfect dwelling. We’re not set on buying or renting or whatever. However it comes to us it just needs to be home. A solid, grounded home. He will not forget me and He will not leave me out of his plans for me and my desires on this earth. My son and I with our matching University of Edinburgh tartan scarves in front of his flat in Edinburgh, Scotland. You can see Arthur’s Seat in the back ground. This entry was posted in Random and tagged 2018, God, home, hope, journey, new year, prayer, temporary, transient on February 2, 2018 by Cate B.